At Hubbard's Farm we sell premium quality wood pellets in 40 lb. bags, by the ton (50 bags per ton), unless otherwise noted. 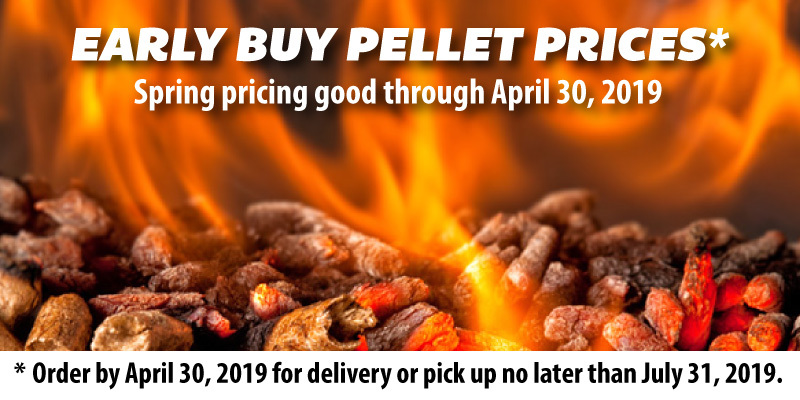 Our pellets can be purchased by calling 978.464.2041 or email us or Order Online by the ton or skid for delivery. See our brands, details, and prices below. Wood pellet performance varies based on a variety of factors. Click on the button to view our comparison chart to help you to choose pellets that have the qualities you prefer. We deliver! Please be sure to check our delivery chart for a list of towns we deliver to and delivery pricing. We recommend that you order your pellets as far in advance as possible. During the winter months, supplies and delivery times can vary. Delivery charge will be added upon checkout. Check our website frequently for availability and pricing. There is an additional service charge of $20 to have your pellets delivered into your garage, as this requires the use of the pallet jack and additional driver time. Please check the box next to I want my pellets delivered Into the Garage at checkout, so we can ensure that our driver is prepared. Wood pellets are also available for purchase by the bag or half ton at the farm. If you plan to visit the farm to purchase our products, please call 978.464.2041 to be sure we have the product in stock and to ensure we are here to assist you. Prices are subject to change on pellets and Envi blocks without notice, due to fluctuating fuel prices.